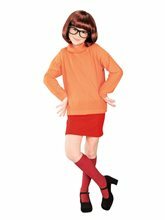 Scooby-Doo Velma Adult Costume.Includes: Wig, glasses, shirt & skirt.Available Size: Standard - One Size Fits Most Adults (up to size 8-12).Material: 100% Polyester.Care Instructions: Hand wash, line dry.Gadzooks! 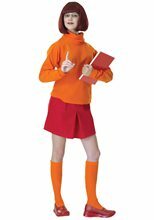 If you love fighting crime, dismantling ghost stories, and running around old haunted mansions in the middle of the night; then perhaps you should consider this fitting Velma from Scooby Doo Costume! This is perfect for the little lady with lots of smarts!Our Velma from Scooby Doo Costume comes with an orange turtleneck shirt and a red pleated skirt. This also comes with a pair of wire-framed glasses for that smart girl theme! This even comes with a burgundy pageboy wig with full curled-under bangs! Pair this up with orange knee-highs and red loafers to complete the look! Order this today and lay this one mystery to rest!